For some, Easter is a time for religious celebration. For others, it’s a good excuse for a long weekend getaway. For all kids, however, Easter is an exciting weekend full of chocolate, bunnies, and family events. Below is a list of some of the best kid-friendly Siesta Key Easter activities, from egg hunts and gardens to waterski shows and heavy machinery showcases. Date: March 30, 10 a.m. to 3 p.m. Kids can kick off the long weekend in the jungle this year with Sarasota Jungle Gardens’ Easter event. 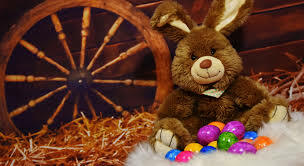 Jungle Trails and Bunny Trails will feature a petting zoo, food, a raffle with great prizes, a visit from the Easter Bunny, and of course, an Easter egg hunt. This event is BYOB – bring your own basket, of course. Sarasota Jungle Gardens is a kid-friendly zoo made up of 10 acres of lush tropical forest. It is home to more than 200 native and exotic animals. Some of them include many types of birds, primates, reptiles such as snakes, iguanas, crocodiles, and Florida’s famous pink flamingos. Many of the animals were rescued or donated. The Jungle Gardens are open for daily admission, as well as summer camps and special events, like their annual Easter celebration. The cost is 17.99 for adults, $16.99 for seniors, $6.50 for children 4 to 16, and free for 3 and under. The annual Siesta Key Easter Egg Hunt is one of the most popular local events for the holiday weekend. Designed for children aged 6 and under, this morning event includes a simple chocolate egg hunt, a visit with the Easter Bunny, face painting, and a goody bag full of prizes to take home. Kids can expect the chance to meet local firefighters, and tour firetrucks and ambulances. Other family activities and entertainment will be provided throughout the morning. The cost to participate is $10 per child (limited to 150 children). Date: March 31, 10 a.m. to 1 p.m. This unique long weekend event is a big crowd pleaser – particularly for the kiddos who love trucks and machines. Put on by Sarasota County Parks, Recreation and Natural Resources, this truck showcase gives families the chance to explore the machines they see at work in their cities every day and talk to the people that drive them. Expect a variety of vehicles, such as dump trucks, firetrucks, payloaders, bucket trucks, and buses. One of the best Siesta Key Easter activities for families, Big Tanuck Day will also include an EGGstravaganza Easter egg hunt for kids with two age categories: 4 and under and 5 and up. There will also be vendors selling food, drinks, and snacks throughout the day. The event takes place at Nathan Benderson Park, a 25-minute drive from central Siesta Key. The event is free and open to the public. For details, call the Sarasota Contact Center at (941) 861-5000. Date: April 1, 2 p.m.
On Easter Sunday, Sarasota’s own Ski-A-Rees waterski team will perform their free weekly show. The hour-long show features skiers of all levels and ages in a thrilling show on Sarasota Bay. Watch the waterskiers dance on top of the water, creating human pyramids, catching air off ramps, and performing other acrobatics. The show takes place on Lido Key, giving you a chance to check out Siesta Key’s sister vacation spot to the north. Bleacher seats are available for viewers, though you’re also welcome to bring your own lawn chair. Parking is free, and there is a concession stand nearby to keep you fed and hydrated. For more information, give the Ski-A-Rees a call at (941) 388-1666.